We're just over half way to raising our target of £5,000 to help pay the legal costs of the #Heathrow13. Help us reach our target: donate here. For more information, have a look at the V&A’s website here. We have since learnt the hard way not to lie on our belly when our arms are locked in tubes, but to lie on our backs! For three weeks local and environmental activists shut down the exploration mining on top of Engebø mountain in the west of Norway. The Norwegian government has given Nordic Mining permission for a open-pit mine, that will dump more then 250 million tonnes of mining waste, including chemicals and heavy metals, in the Førde fjord. The blockade started on the 1st of febuary, and lasted until the 20th of febuary. During the three weeks over 100 people participated in the actions, and 80 people got arrested, with a total of fines close to 100 000 EUR. The activists blocked the entry road to the mountain and the exploration machinery through non-violent direct actions. The second day of the blockade, the CEO of Nordic Mining, Ivar Fossum, told the media that «They do what they think is right. These are great and committed youths». On Tuesday 22. of February, two days after the blockade was finished, the same CEO confirmed that Nordic Mining will file a multi-million lawsuit against the activists. The group of people who occupied the drilling machinery were between 16 and 62 years old, but the majority of us were youths and students. None of us have the kind of money that Nordic Mining is coming after us for. And if their lawsuit goes through, we stand in danger of losing our homes, any money we might have been able to set aside, and go personal bankrupt. That’s why we can’t let them win, and we can’t let them get away with it. This is about so much more then the 80 of us who got arrested – it’s about the right to protest. And the importance of civil disobedience as a security valve in our democracy. If this lawsuit goes through, then we stand in danger of creating a dangerous precedent where big companies can go after activists when they dare to stand on the wrong side of the law – but the right side of history. That’s why we need your help, and we need it now. We need to create a massive pressure against Nordic Mining, that will force them to drop the lawsuit. I’m hoping you can help us defend the right for non-violent direct actions, and at the same time help us from going bankrupt. On the 24th of February, we - the Heathrow 13 - were sentenced to 6 weeks in prison, suspended for 12 months, with an additional 120 to 180 hours community service on top. Whilst we are happy to not be in prison right now, this is far from a complete victory. As our barrister QC Kirsty Brimelow, so eloquently argued, there is a long tradition of direct action in the UK, and a convention for sentencing within the legal system. In fact Lord Hoffman, in an influential ruling, went as far as to say that it is the mark of a civilised society to accommodate this, and that the legal convention is for sentences such as a conditional discharge or community service. In this light, our barristers argued that our action clearly did not cross the custodial threshold – i.e. our sentence should not be imprisonment, immediate or suspended. The fact that Judge Wright chose to give us a suspended sentence marks a shift in the way protesters are treated, going against the normal convention. Experts have suggested that if magistrates impose custody for minor offences, that produces an incentive for activists to commit more serious offences. This is because more serious crimes are dealt with by a jury, who are more likely to be understanding of the issues. Whilst more radical actions are welcome, and in fact are necessary to tackle the scale of climate change, repression from the judicial system is not. 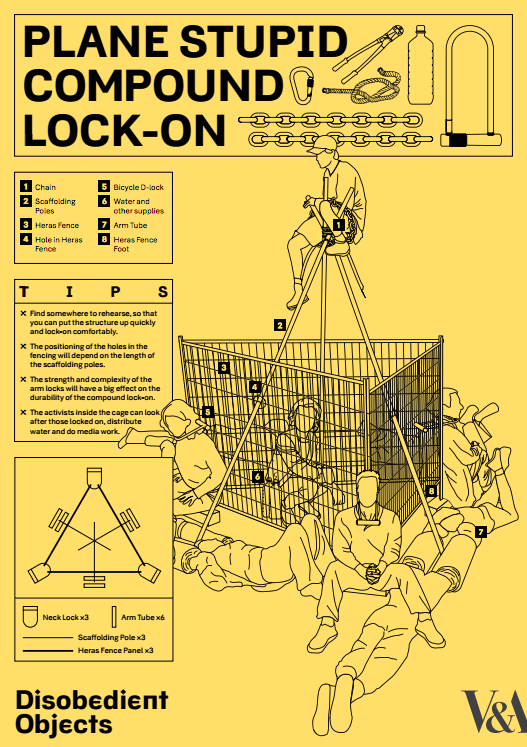 As we went into court on the 24th, all of us were prepared for the possibility for prison. We all experienced a rollercoaster of emotions, from fear and stress to defiance and pride. The support and love we were shown by family, friends and the wider movement made us feel all the more ready to deal with a potential prison sentence. Had we gone to prison, we would have depended on this support network around us. We all feel so grateful for this. Yet, we should reflect on this as a form of privilege. There are over 85,000 people in prison in the UK, not including immigration detention centres, secure children's homes or those detained under the Mental Health Act. Those imprisoned are disproportionately from poor, minority backgrounds and are likely to have suffered various forms of abuse in their lives. Vulnerable people are the ones being targeted by the judicial system. These people are highly unlikely to be able to gain the same kind of support a high profile privileged group such as ours could. That's not to say, however, that these groups of people are mere passive 'victims'. Take for instance, the recent, horrific case of Sarah Reed. She was a Black woman who was subject to multiple failings by the police, who wrongfully arrested her twice, once beating her whilst doing so, and by the mental health services, who failed to care for or protect her. She went on to die in Holloway prison (where the females of the Heathrow 13 would have been likely to have been sent). As well as dealing with the grief of this horrific treatment, Sarah Reed's family are campaigning for justice, along with the families of many of the other 827 people who following contact with the police between 2004 and 2013, and those fighting under the banner of #BlackLivesMatter. What we have been threatened with, thousands more suffer from and much worse. Our briefest of experience of this shows the importance of solidarity between different but connected campaigns. And these issues are connected in many ways from their root causes, to the people who are affected most. For it is not only poor communities, Black and brown people and women who are treated worst by the justice system, but these are the same groups, who on a global level, are worst affected by climate change. So, we the Heathrow 13 are free to fight another day (so long as we aren't arrested in the next 12 months), but many others are not. We should use this briefest of experiences to build solidarity with different affected groups from #BlackLivesMatter in the UK to those fighting airports in Istanbul and Atenco. For only by trying to understand the world, and the listening to the experiences of those we wish to fight alongside, can we hope to change it for the better. 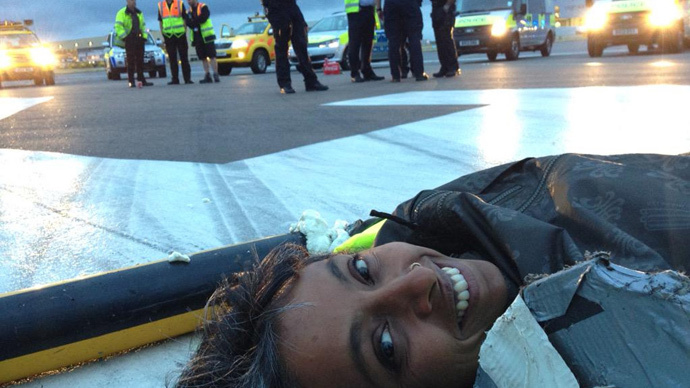 13 Plane Stupid activists have been spared jail today for protesting against new runways that would cause climate chaos. This is a huge relief for the activists and their families, and a massive boost for the movement to stop airport expansion. The court's U-turn over a prison sentence is a vindication of the right to peaceful protest. At a time when we need to be cutting emissions rapidly, the Government is planning new runways to massively increase them. And to get away with it, it's trying to shut climate change out of the debate. 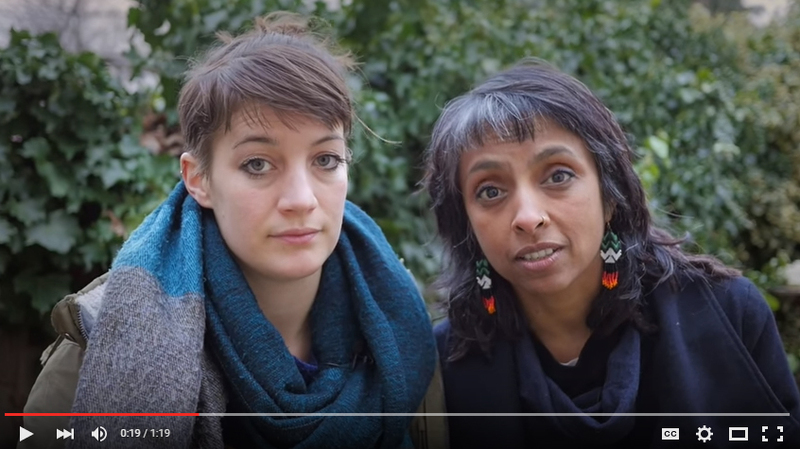 Can you help carry on what the Heathrow13 have started? It's because of people power that we don't have a third runway now. People power will stop new runways again. We're in it for the long haul. No ifs, no buts. Those pushing for new runways are trying to keep climate change out of the debate. They hope harsh sentences will help shut that conversation down. But we can stop them. 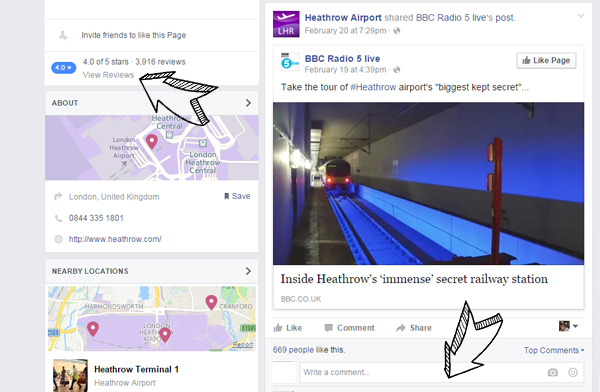 Visit Heathrow’s Facebook page and leave polite comments and replies on their latest posts. You can also leave a one star review along with a comment. Prince Charles has said that drought linked to climate change is a 'major reason' for 4 million Syrians becoming refugees - those 4 million need emissions cuts now, not new runways. I support the #Heathrow13. At a time when we urgently need to be cutting emissions rapidly, why are you planning a new runway to massively increase them? I support the #Heathrow13. Heathrow’s emissions aren’t just a threat to polar bears. They are killing people now, and another runway will hugely increase that death toll. I support the #Heathrow13. A third runway at Heathrow will exacerbate the air pollution crisis that’s already costing thousands of lives every year. I support the #Heathrow13. The aviation industry is the fastest growing source of greenhouse gas emissions. How can we take meaningful action to prevent catastrophic climate change while it continues to expand? I support the #Heathrow13. Leave a Google Review. Google Heathrow Airport, and leave a polite one star review letting them know what you think of new runways. Again you can use your own words or the talking points. Like and rate other activists' reviews - this will make our message go further. On Twitter: Click here to tweet Heathrow Airport. If you’d prefer to use your own wording, just tweet at @HeathrowAirport - again you might find the talking points helpful - and use #heathrowcommunity and #hexupdates. You can also reply to @HeathrowAirport’s tweets and use #heathrow and #takingbritainfurther. On Instagram: Use #heathrowairport and comment on posts by @heathrow_airport. On Google+: Use #heathrowairport and comment on posts at the Heathrow page. On Yelp: Leave a polite one-star review at their Yelp page. Join us in asking David Cameron to stick to his "No if, No buts" promise and pledge to reject any new runways, at Heathrow or elsewhere. 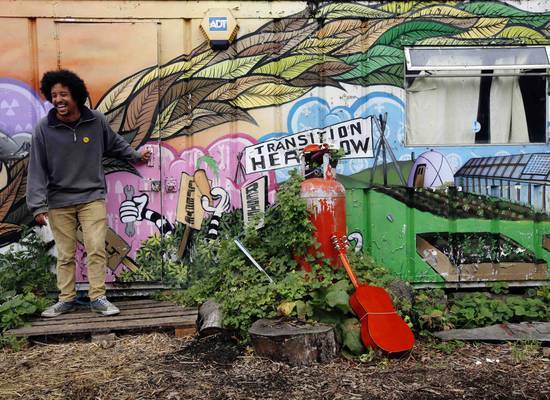 If we want real social change, that means taking bold, effective direct action. Reclaim The Power will provide 'out of the box actions', ideas for tools and sites of action, support and training for anyone who wants to build their confidence gradually or save time on action planning. The Reclaim the Power website will soon have a secure media sharing platform developed for the purpose, which will update participants about others' regular actions, providing inspiration and motivation to work together. Now the dust from the Paris conference has settled, it’s time to set ourselves a challenge: can we do more for climate justice in one year than UN COP negotiators have achieved in the last twenty one? Get involved by ringing or emailing Reclaim the Power. Finally, why not reward yourself and come to Grow Heathrow's 6th birthday party from 4th to 6th March? 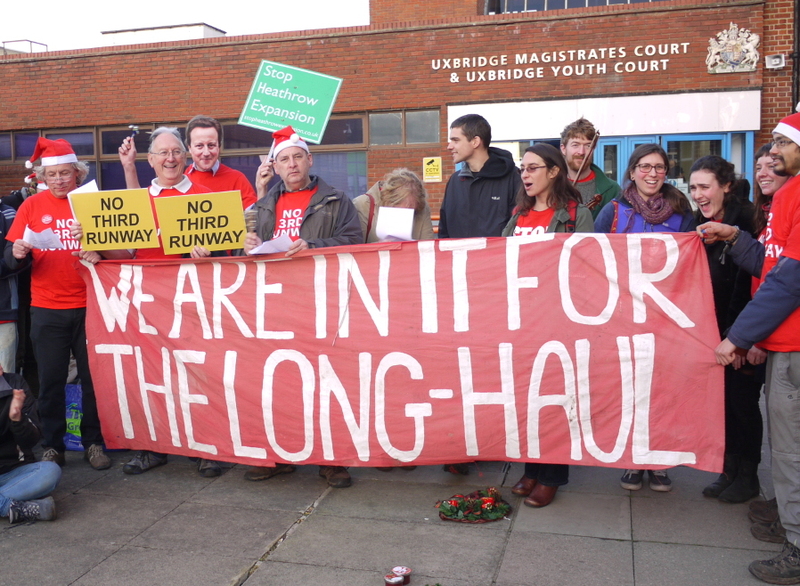 Thank you for standing with the Heathrow 13 and saying no to climate-wrecking new runways. Together we can expose who is really guilty here. Margot Leicester on behalf of the families.